HayPro II was developed to inhibit the organisms that cause heating and mold in high moisture baled hay. It is composed of naturally occuring digestive acids that are pH balanced for stability. These acids are among nature’s most powerful mold and bacteria inhibitors yet all animals produce these acids during digestion. HayPro II is a safe, natural way to protect baled hay. Baling high moisture hay is not without risk. It requires common sense and careful attention to details (determining moisture levels, proper calibration of spray equipment, method of application, weather conditions, proper storage practices and other influencing factors) that are beyond the control of the manufacturer. Twine Tension should be the same as on dry bales. If bale weight is too heavy, shorten the bale. Do not loosen the tension. Chopped Hay or Straw. Do not treat with HayPro II. STORAGE. 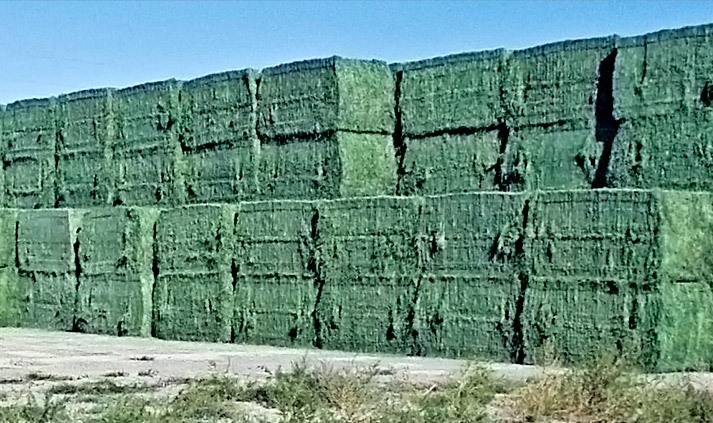 Never store treated hay in contact with untreated hay. Separate the hays with 12″ air space. Hay stored outside should be covered. Hay stored inside should be well ventilated on sides, with head space between hay and roof. Indoors or outdoors, set hay in an area that prevents moisture from entering the hay from the ground. MOISTURE METERS. 1) Do not use HayPro II without the frequent use of an accurate moisture meter. 2) Never guess at moisture or application rates. 3) Maintain your moisture tester as suggested by the manufacturer. Make sure batteries are fresh and the probe is frequently cleaned with rubbing alcohol. MONITORING MOISTURE. 1) Moisture levels can vary widely within a field. Determine the hightest baling moisture to be found in that field and treat all of the hay accordingly. 2) When using a probe type moisture meter, make sure the dew is off and the bales have not yet been treated. This surface moisture prevents an accurate moisture reading. 3) Bale a few trial bales. Probe bale in 5 or 6 locations perpendicular to wafer to find the highest moisture reading. When finished, set the trial bales aside for immediate feeding or rebale using HayPro II. 4) Don’t cheat. If you treat for the average moisture, some of the hay will be under treated and likely to spoil. This spoilage can spread. APPLICATON RATES. Even coverage is important for good results. If you need a greater volume of liquid to get a good spray pattern, mix HayPro II with an equal amount of water and double the application rates.